provides you accessibility in a city like Istanbul which is famous with its crowd and traffic. Taksim Square which is the most significant and famous square of Istanbul is in the walking distance to Süzer Plaza. Taksim Subway Station which is the heart of mass transportation network of Istanbul and the entrance of Istiklal Street which is the shopping street are also situated at this square. 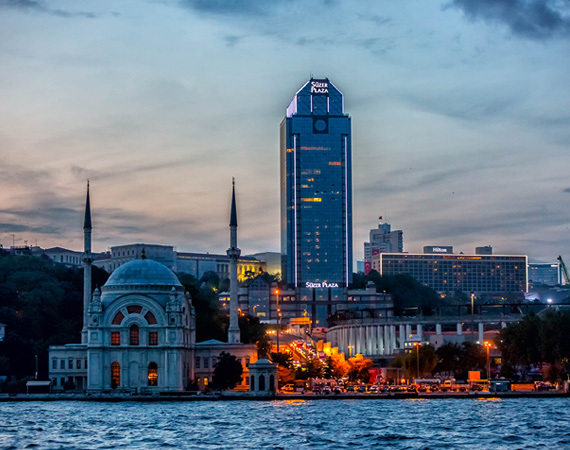 Istanbul Lütfü Kırdar International Congress and Exhibition Palace and Harbiye Open Air Theater situated in the congress premises bringing the business, culture and art world of Istanbul together are in the walking distance to Süzer Plaza. Dolmabahçe Palace having a specific reputation among the Ottoman palaces is among the palaces constructed in the 18th century. Dolmabahçe Palace which is only two minutes far away from Süzer Plaza by foot can be visited between 9 a.m. and 4 p.m. except for Mondays and Thursdays. Historical Peninsula where ancient structures such as Topkapı Place, Hagia Sophia and Basilica Cistern are located is 10 minutes far away from Süzer Plaza by car. Unauthorized use of the content and pictures of the website are prohibited.